This thread is for owners of the Helix to review their titanium folders - given that the original Helix thread is getting very long and complex - and for others to ask questions about the Helix. I received my four Helixes from Peter (the designer, owner, manufacturer etc) over a week ago, and more are shipping as I write so I figure a thread like this may be helpful to exchange ideas. So far, I have only had about 40 minutes on it due to my schedule. I've gone up hill, down hill, on rough roads, etc. The bike feels very close to a full-sized bike to me. If I did not look down and see a 24" wheel, I would think that I was on a pretty normal bike. The steering is light and neutral, but not twitchy. My background is road bikes with some nice mountain bike rentals. Given that these are not mountain bike tires, the bike feels surprisingly damped. Perhaps titanium does damp vibrations. The fastest I've gone downhill is approaching what feels like 30 mph and the bike is stable. (I've hit near 60mph on road bikes but that is a different affair.) As to rigidity, it seems rigid enough though I've not paid particular attention to that. I know that I have stood up on the bike to mash on it, and it's been fine. At one point in my ride, I was looking around for cars and did not see a large and relatively deep (4"?) manhole cover dip and hit it going full speed. Breezed right through without any drama. It did scare me a little - not by the bike but about my own inattentiveness. Currently, I am still not familiar enough with the bike to really push it through the corners. In the back of my mind, I'm still a bit nervous about the joints though they are rock by feel. 1. Titanium. Never thought I could justify/afford full Ti bikes. Even the seatpost (standard diameter) is custom made in house out of Ti. Love that Ti look!! 2. Performance for the dollar is remarkable for Kickstarter supporters. If this was a regular framed titanium bike made in Canada, it would be an excellent value. The fact that this is a brilliantly designed folder makes the value proposition OFF THE CHARTS for me. Even at the current preorder price, it offers very high return for the dollar. 3. Folds amazingly small - especially considering the 24" wheel. Today, I took my compact Subaru Imprezza to haul a bunch of stuff. The trunk and rear seats were packed to the gills and I wondered if I could still haul the bike from my parents home in the front seat. Popped it in there on the front with loads of room to spare. The helix really is a great fold! I wonder if this has one of the highest wheel size to folded size (WSFS) ratio. (Analogy - cell phones now tout their screen to phone size with Samsung S10 series at 89%.) Someone should make up a term for that - WSFS is a bit balky. I am quite sure that the WSFS ratio significantly exceeds even the Brompton as the folded Brompton's frame is above the wheel while the Helix is a few inches under the wheel. Helix plans to come out with a airline checkable case for it. Not sure if there's another 24" folder on the planet that can be packed into an airline checkable case without having to disassemble the wheels. With Helix, all one has to do is the regular 20 second fold and deflate tires. 5. Technical superiority. (As a former engineer, this really appeals to me.) The titanium welds are superb. The Ti welds are completely done by robots - the first ever in bike manufacturing history. They are basically perfect and repeatable. This contributes to durability and consistency. Then there are the joints. I'm not going into the joints here but they are beautifully designed and executed - and very secure. Supporters privy to the internal communications know that Peter is a perfectionist which led to the extended delay as he kept improving the design. However, I am glad for the wait to receive a version 1 bike which is already relatively mature in the design after many iterations. 6. Supposed durability. The bike is overdesigned and Helix requested the durability test be twice as many cycles of industry standard. Also, they sent one part for all the tests. Supposedly manufacturers will send multiple pieces of the same parts so that each part can be tested once. 7. 24" wheel. That was the primary selling point for me when my wife and I first explored folding bikes about 4 years back. I tested 16, 20, and 700c folders. We did not like the small wheels. 24" seem like the right compromise for us. 9. Folds beautifully and efficiently. There's a visceral pleasure about folding something so beautifully designed and solidly constructed into such a small package. I am still gingerly folding it as I am afraid of scratching it but in time, the fold can be easily done in 20 seconds. 10. Rolls beautifully when folded with the seat post extended for a hand hold. So this is good for fun trips where there are restaurant stops etc as it should fit under the tables and such. As long as there are no accidents or theft, this bike (the frame at least) should outlast my lifetime. 14. Made in Canada. Nothing against the Orient where I visit every year but there's something special about a North America manufacturing effort of this quality. 15. Peter, wife, and team. There's actually a single person leading a team behind this vision and execution. There's a personal connection with the bike due to a connection with Peter as an initial supporter. There are more Pros but that's plenty. 1. For supporters, the bike is significantly delayed. On the Kickstarter website, it was supposed to ship on March 2016 so we had a three year delay. (I personally never doubted the delivery due to the strength of Peter's vision and background - but it was a long wait.) However, the delay has a lot to do with improvements so that the delivered bike is actually superior than what was promised. 2. Weight increase. 10 speed version went up from the originally projected 21.1 lbs to 24.4 lbs. I'm not a weightlifter by any stretch but I do curls with 25 lb dumbell which is pretty average (or low?) for a male and the bike feels light to carry. I can lift or roll without much effort. I think that the original projected weight was optimistic but my understanding is that a lot of the weight increase came from making the bike more bullet proof. 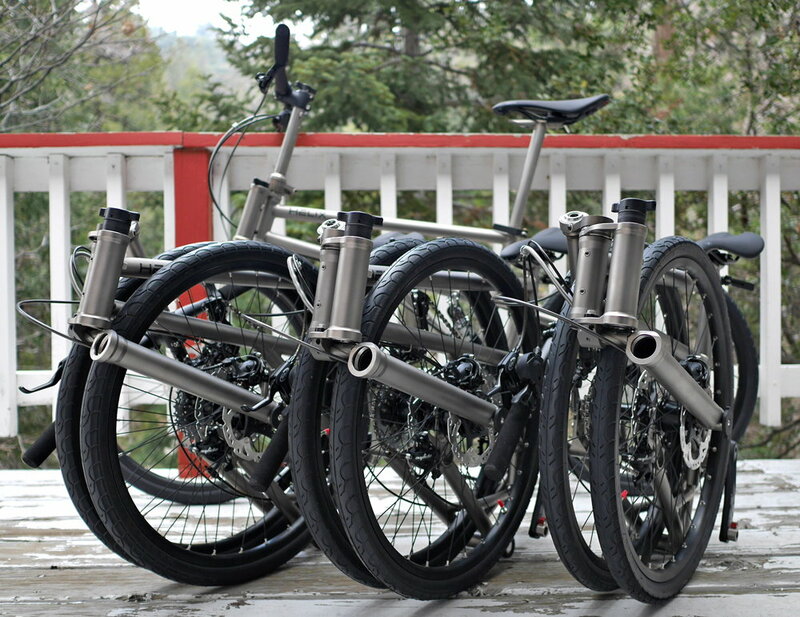 However, as I look at other folders, taking into account the 24" wheel, massive over engineered joints, and disc brakes, the weight seem reasonable. According to Peter, if anyones care to put $ into lighter components, the bike can approach 20lbs. 3. Preorder not yet re-opened. I'm not sure when preorder will re-open but there is a wait as Helix delivers over 1400+ bikes. It is on the strength of raising over $2 million that allowed Helix to be a much better bike than originally promised. Regardless, there is going to be a wait though it should be a lot shorter than the Kickstarter wait as delivery will accelerate. 1. I plan to wrap one some of the Ti tubes with 3M clear bra material to protect against scratches. 2. I hope to find a handle bar that is narrower to suit me better. Last edited by Ultralight; 04-03-19 at 01:32 PM. Can't you just cut the handlebar down in width? Nice review =). Good review. With luck mine might arrive this September. I use a tubing cutter to cleanly cut down handlebars. Thanks for the review, Ultralight. I hope you keep us updated with further thoughts, opinions and pics when you've ridden it a bit more. I really hope the production pace ramps up so the rest of us backers and pre-orderers get to ride Helix this year. I was told I'd receive my bike in July, but there is NFW that is going to happen. Would be nice to get to ride it in Autumn 2019 though. It's possible to see more details? Some fotos? I need to go deeper into it and also i'd like to try it, before give my opinion; best regards. Thanks everyone, especially on the pipe cutter suggestion. makes sense - a free modification if I can borrow one. Good to contact other supporters here. Mr. Flamey, lets hope that production ramps up so efficiently that your prediction is inaccurate and you actually get it sooner than you anticipate. I bought my Helix here in Singapore from a guy who ordered it close to 4 years ago and just received his bike a few weeks ago. The serial number is in the single digit and probably the first here in Singapore. I’ve so far ridden a couple hundred km in the last two weeks. The bike feels stiff and very nimble and rides really well. I’ve managed to go as fast as 35 km/h on short stretches and average about 22 km/h on the single-speed Helix. I’m a new member here and can’t post pictures yet but you can see some photos of the bike on my Instagram #helix_singapore. Fantastic news. Thanks for the thorough review. I'm very happy that you have your bikes and I'm happy that Peter is seeing his dream come to fruition. He has had a lot of personal attacks on him. Doing things like this is really difficult and I admire the perseverance he has shown. I wish you many happy years of riding! Last edited by FoldingStyle; 04-07-19 at 12:15 AM. Ipohboy, Wow! (& Apa Khabar) He/She waited 4 years and sold it right after receiving it? May I ask what he charged you for the Helix? And what is your serial number? (It has to be between 1 and 5). Anyways, glad that you are enjoying it. I agree particulary with the nimble feel - and yet I don' feel it is twitchy. It's a good feel. By the way, I routinely pass by Singapore and Malaysia - and will be teaching in KL for a few weeks this summer and was invited to speak in Singapore during the same time frame so I had to decline. Singapore has to be amazing for riding given how amazingly well maintained is the entire infrastructure. I'd be tempted to bring my Helixes but our schedule is flat out too tight to get much riding done. Also been to Ipoh. FoldingStyle, I'm not sure if photos of the locking mechanism will tell you much as most of it is inside the tubing. But I will say that it is very elegant and the knobs are better than levers. The seat post is another brilliant design in how the seat can slide front and back so easily with a lever flip on the custom made Helix Ti seatpost. Last edited by Ultralight; 04-07-19 at 02:29 AM. By the way, the guy who sold me the bike bought like another 7 or 8 bikes while waiting so he had to sell the Helix... price I paid was reasaonable.